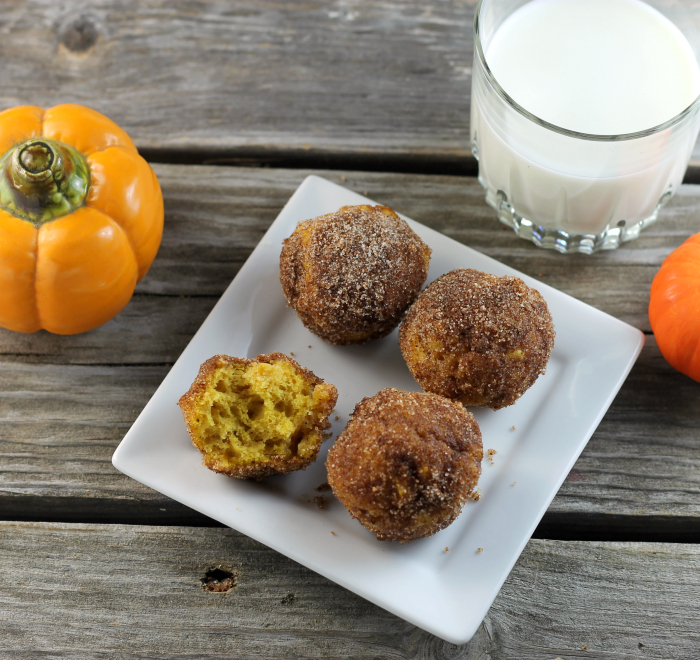 Woohoo, this is pumpkin at it’s yummiest… baked pumpkin donut holes. I am sure there are a few of you out there that have pumpkin, turkey, and all of the fixing on your mind, with Thanksgiving a week away from tomorrow. I am actually not making Thanksgiving dinner; it is always at my mom’s house. But I will be going out the night before so that I can get up with her and help her in the kitchen. I have been doing this for a few years now. My dad passed away a number of years ago and, she enjoys the company when I come to stay overnight. We will sit around and visit, probably reminisce about days long gone. To tell the truth, I would say that I enjoy it as much as she does. We will get up bright and early Thanksgiving morning to start the fixing for the big dinner. And as the morning goes my family will trickle in and lend a helping hand as well. There will be card games going on during the day and the kids will be doing their own things as well. And let’s not forget about all the food!! It definitely a fun day for old and young. Yeah, there are plenty of things to thankful for. Do you love donuts? I know that I do. It has been years since I made donuts; especially the ones that you fry in oil. Boy are they a lot of work! I have been thinking about donut holes and to me they sound like they would be easier to make than the whole donut. I was looking around the web when I saw baked donut holes baked in mini muffin tins. Wow, what a great idea!! I actually have a couple of mini muffin tins. And since it is the Thanksgiving season, it has to be pumpkin. But not pumpkin alone, there has to cinnamon, ginger, nutmeg, and cloves to add some fall flavor. 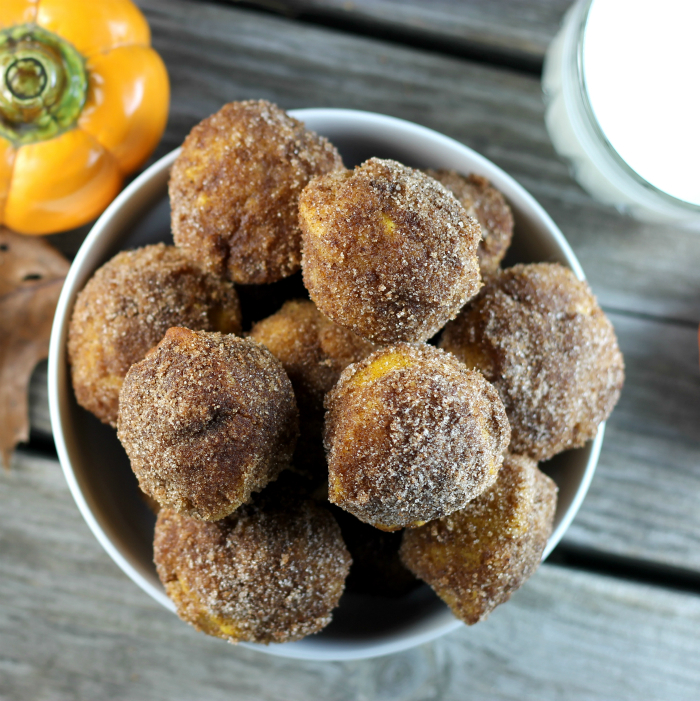 The donut holes are yummy on their own, but they are rolled in butter, sugar, and spices to make them out of this world yummy. I might say that they are a touch healthier since they are baked and not fried. What I know for sure that they are delicious!! 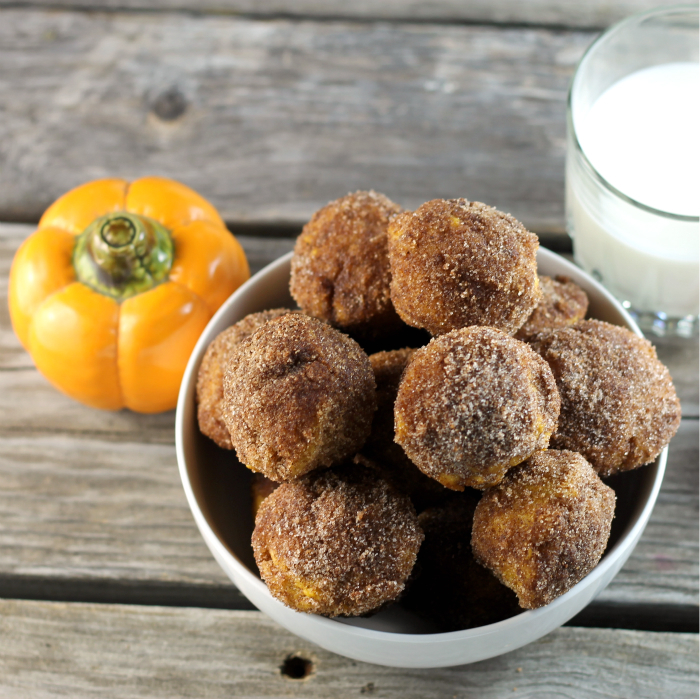 Maybe these baked pumpkin donut holes will show up on the breakfast table thanksgiving morning, One can only hope! Preheat oven to 350 degrees F. Spray mini muffin tins with non-stick cooking spray. In a large bowl sift together the flour, baking powder, salt, cinnamon, nutmeg, ginger, and cloves. 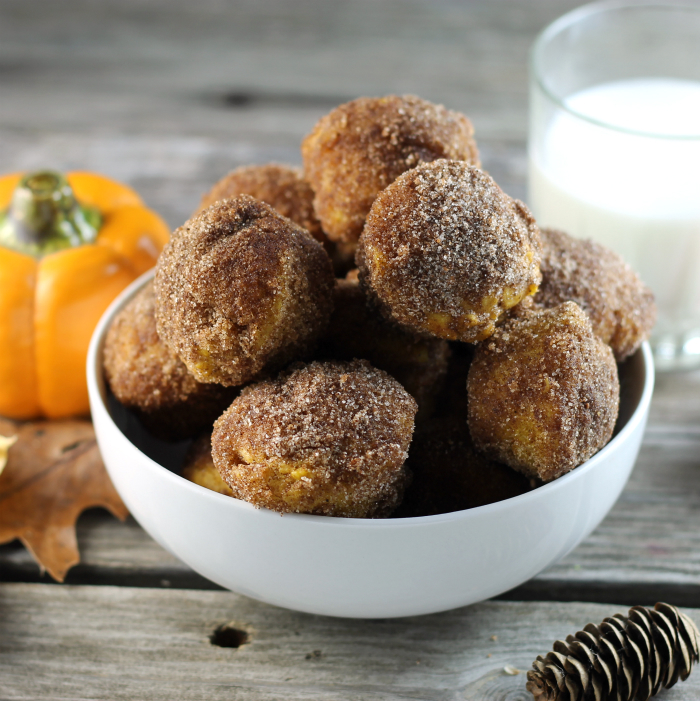 In another bowl combine the sugar, 1/3 cup melted butter, pumpkin, vanilla, milk and egg. Once these ingredients are mixed together pour them into the bowl with the dry ingredients and mix until combined, making sure not to over mix. Divided the batter between the 24 muffin cups. Place in the preheated oven for 12 to 14 minutes. Remove from the oven and let cool for a couple of minutes before removing them from the muffin pans. While the muffins are cooling melt the 5 tablespoons of butter in a bowl. In another bowl combined the sugar and spices. They look so inviting with that spiced sugar coating. Hi Dawn, so wonderful that you get to spend this time with your mom, what a treat. 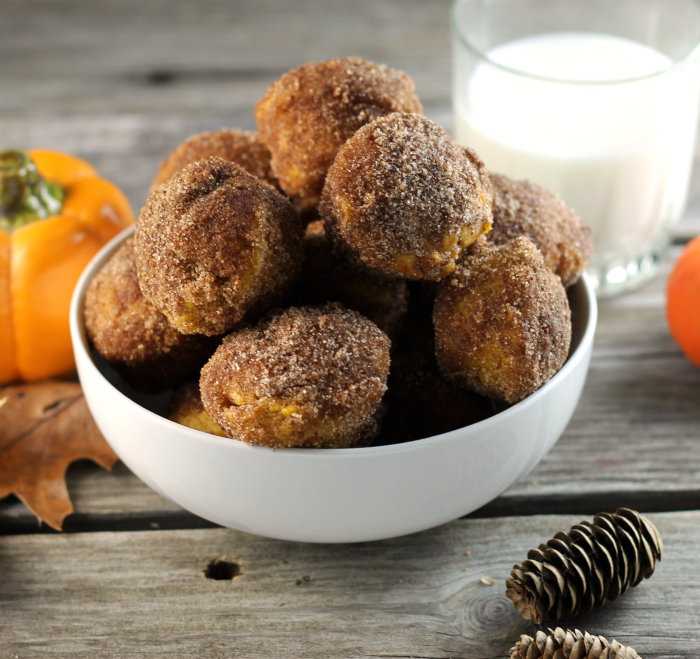 Speaking of treats these donut holes look amazing, love the flavor. These donut holes look super tasty! I love all the spices you used. The spiced sugar coating sealed the deal –these look outstanding!!! I don’t celebrate American Thanksgiving but it sounds like you’re in for a yummy day. Sorry to read about your dad. Very cool that you stay with your mom. Have a wonderful holiday and boogie boogie.